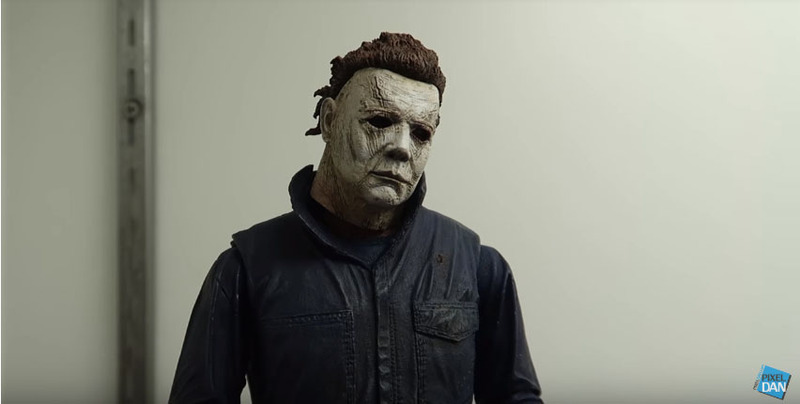 Neca has not had the Halloween license for some time, but it now looks like they do in fact have the license for the new Halloween movie, as they just unveiled a new Michael Myers figure inspired by this year’s film during Wednesday’s preview night at San Diego Comic-Con (SDCC). The 7-inch figure will be part of Neca’s “Ultimate” line and it will come with a new jack-o-lantern from the film, the decapitated head of one of Myers’ victims, and multiple heads, among many other accessories yet to be revealed, according to an interview with Neca’s Randy Falk by YouTuber Pixel Dan, which you can see below along with some screenshots. UPDATE: Official photos have been added. You can pre-order yours from Entertainment Earth here. So while Mezco has its own One:12 Collective and Living Dead Doll figures of Michael Myers from John Carpenter’s original Halloween, Neca will be bringing the first ever officially licensed figure of The Shape from Halloween 2018. See more from #SDCC here! Halloween 2018 arrives in theaters on October 19, starring Jamie Lee Curtis, Judy Greer, Andi Matichak, Nick Castle, and James Jude Courtney, directed by David Gordon Green and executive produced by John Carpenter, who also performs the score.